The government completed its five-year term last night and today former Pakistan chief justice Nasirul Mulk is set to take oath as the country's seventh caretaker prime minister. On the night of May 31 the parliament was dissolved and the country has essentially entered preparation mode for the elections, which are scheduled to be held July 25. After much deliberation between the government and the opposition, on May 28, justice Mulk's name was finalised for the position of caretaker PM. The question is, why do we need a non-elected individual to run the country for the next two months? 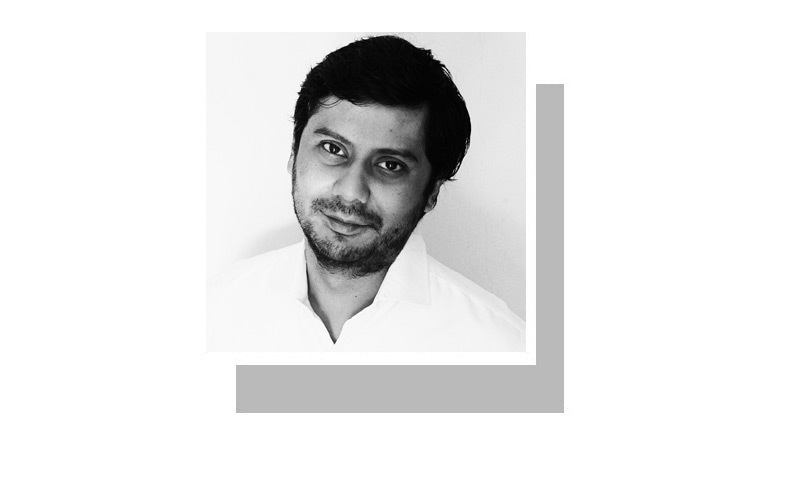 In Pakistan, instead of the elected government stepping into ‘caretaker modus’ once its term is complete, as is the norm around the world, non-elected officials are appointed to form an interim caretaker government to oversee matters. 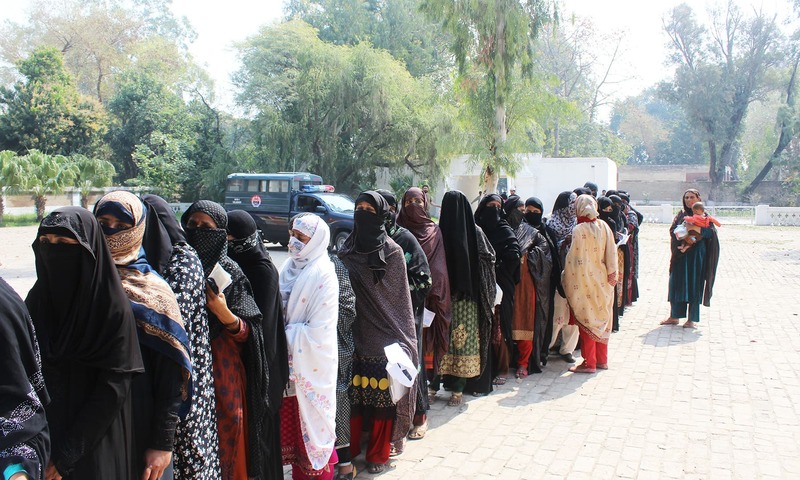 According to a report by Democracy Reporting International (DRI) — a non-profit organisation that claims to promote political participation of citizens, accountability of state bodies and the development of democratic institutions worldwide — Pakistan is the only democratic country which adopts this method of preparing for elections. The caretaker cabinet in Pakistan has one primary job: to create a conducive environment for free and fair elections in the country. Apart from that, the caretaker government is also responsible for executing the routine functions of the government and making sure that Pakistan does not come to a standstill in the time between the dissolution of parliament and a new government being sworn in. The caretaker setup has to be impartial and not have any political affiliations so that it does not try to interfere in the election process or sway it in a certain direction. Since the 20th Amendment — passed in 2012 — the president no longer holds discretionary powers to appoint a caretaker prime minister or chief ministers of his choosing. The amendment instead extends the right to the prime minister and leader of the opposition in the outgoing National Assembly, and the chief ministers and the leaders of the opposition in each outgoing provincial assembly. 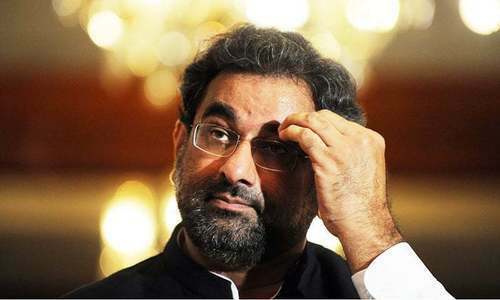 The 20th Amendment also introduces Article 224A into the Constitution, which ensures that in case the PM and the Leader of the Opposition are at an impasse about the final choice of a name for the caretaker prime minister, the matter would be taken to a parliamentary committee with an equal number of members from both sides, who will then make the final decision regarding the appointment. A similar six-member bipartisan committee comprising members of the provincial assembly makes the decision of the caretaker CM of each province. If these committees are unable to decide within three days, the matter is then referred to the Election Commission of Pakistan, which is bound by law to take the decision within two days. Once the caretaker executives are chosen, the federal and provincial caretaker cabinets are formed on the advice of the caretaker PM and CMs, respectively. 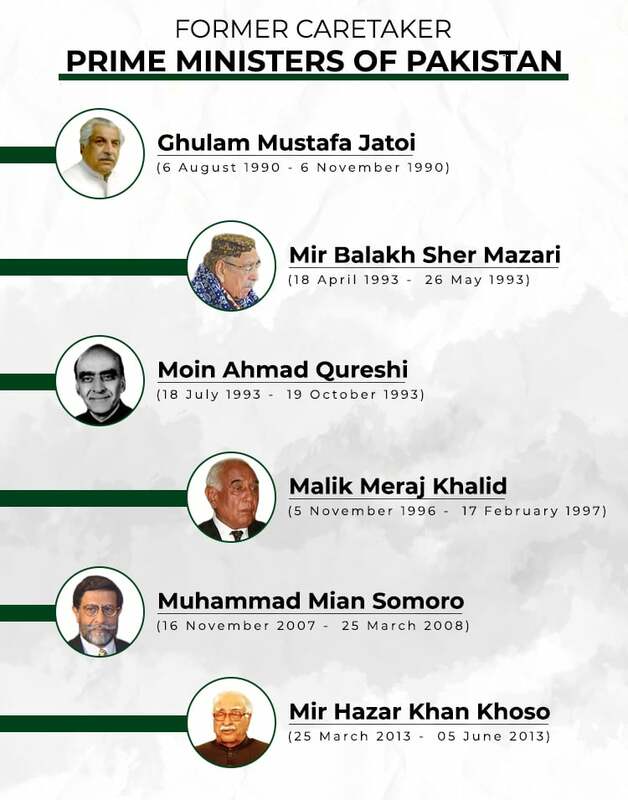 Pakistan's sixth caretaker prime minister, retired Justice Mir Hazar Khan Khoso, was the first to be chosen under this method. His appointment was made by the ECP as the PML-N, then the major opposition party, had objected to his name. The matter had not been resolved through discussions within a parliamentary committee either. The caretaker setup is not only governed by the 20th Amendment: the 18th Amendment and the ECP’s Code of Conduct for Political Parties and Candidates — which it issued in 2013 and is expected to issue again this year — also ensure the neutrality of the caretaker setup. In 2010, the 18th Amendment had added sub-article 1B to Article 224. Article 224 (1B) bars members of caretaker cabinets, including the caretaker prime minister and the caretaker chief ministers and their spouses and children, from contesting the next elections. The amendment looks to enhance the impartiality in the process and ensure that the caretaker setup is not likely to interfere in the elections. 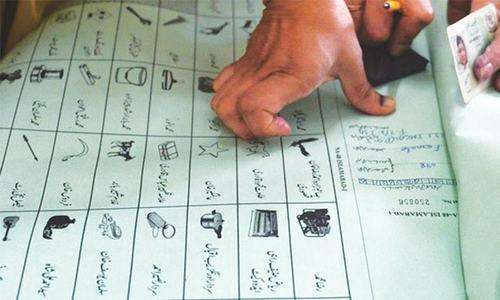 In its Code of Conduct for Political Parties and Candidates - 2013, the ECP had taken a step further and barred the participation of the caretaker PM, the CMs, as well as the president and governors — along with most senior cadres of government — in the election campaign. be impartial to every person and political party. 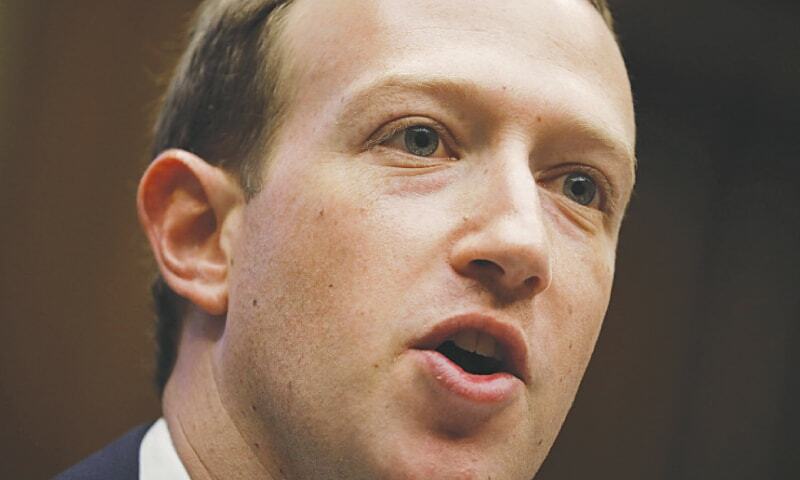 attempt to influence the elections or do or cause to be done anything which may, in any manner, influence or adversely affect the free and fair elections. 3. Providing statements of assets and liabilities: The Prime Minister, Chief Minister or a Minister or any other members of a Caretaker Governments shall, within three days from the date of assumption of office, submit to the Commission a statement of assets and liabilities including assets and liabilities of his spouse and dependent children as on the preceding 30th day of June on Form B and the Commission shall publish the statement of assets and liabilities in the official Gazette. 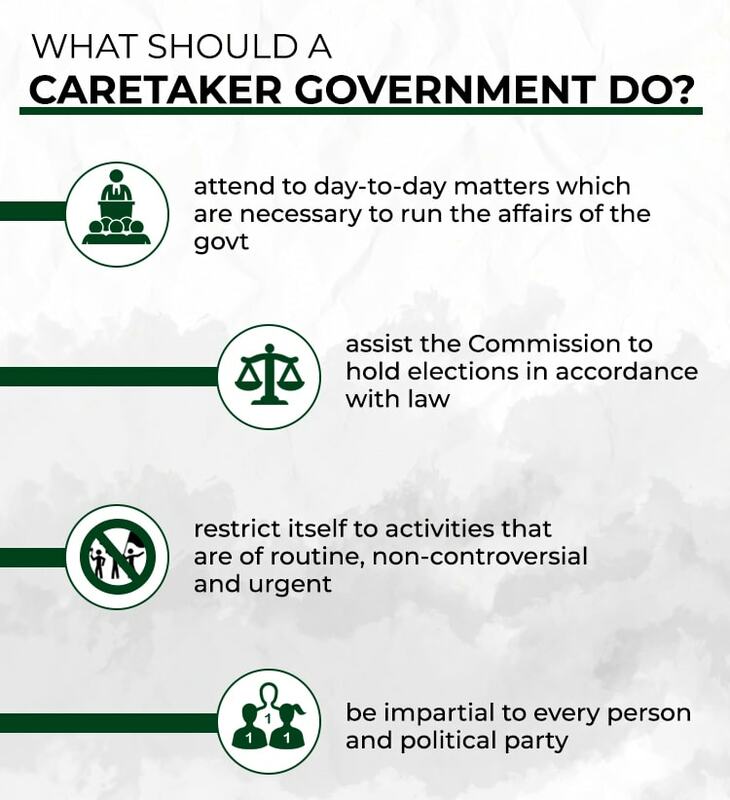 However, in spite of these provisions, there still remains a need for there to be set parameters in which the caretaker setup operates, as currently — in the absence of regulatory guidelines — the interim government technically has all the powers that an elected government holds. “Lacking clear guidelines, the 2013 caretaker government was marked by prevailing confusion about its mandate and function,” notes the DRI report. This fact was proven true by a June 6, 2013 verdict of the Supreme Court of Pakistan, after which all appointments, postings, and transfers made by the caretaker government were deemed null and void. This verdict was issued over a petition filed by the PML-N's Khawaja Muhammad Asif, who wished for the court to reverse various appointments and postings that the caretaker set-up of 2013 had set in motion. Referring to Articles 2(A) and 48(5) of the 1973 Constitution, the court had said that only elected representatives can run the affairs of the state. “The Supreme Court, however, had noted the absence of guidelines to be observed by the caretaker government,” the DRI report says. It is disconcerting that despite these observations from the top court, no legislation was introduced to define the parameters that govern the workings of the caretaker government. From the various methods that can be used to draw up a framework for the caretaker government to follow, many countries, including the the United Kingdom — which has no written constitution — use certain conventions. In the UK, these conventions are “binding rules or a set of behaviour accepted as obligatory by those concerned with the workings of the government." However, even in countries that do have a constitution, the conventions dealing with the caretaker government usually look to solidify its ‘interim’ status and ensure that the caretaker cabinet has a defined mandate and follows some basic principles. Another option to set out the rules and limitations of the interim administration is to create a code of conduct for it. India, for example, follows a code set by its election commission. It sets guidelines for all officials who would remain in power in between the two elected governments. A third, and the most sensible option is to pass legislation through proper means in order to ensure that the caretaker setup has a set of proper guidelines in place to help it do its job without prying on powers that lie with elected governments. Leaving the door open, by not setting parameters for the caretaker setup, the country leaves itself at risk of losing time, finances and effort in first taking on the caretaker government’s decisions and then reversing them by challenging them in a court of law. Go with India's method. "Code of conduct" is the best way. Very informative and well written but our country is far behind than India and UK . So, Pakistan is similarly junior in terms of democracy . But it is expected that after these elections there would be sufficient legislation on this matter too. Why the need for a Caretaker Government has not been clearly explained. This is a flawed system. Make Election Commission totally independent and strong and continue with the same government as an interim government in the period when it finishes its' term until new one is sworn in. Waste of resources, because Pakistani politicians do not have trust in each other, there is no need to have a caretaker. A proper caretaker set up is needed and if this is not possible, then elections should be held under the auspices of the President of Pakistan and the federal bureaucratic apparatus. We must only have topmost intellectual and highly qualified in their field professionals to form the interim government. Still does not explain the basic question in the title. "Why" is a 'caretaker' government required? This is a completely flawed system of handing over the affairs of the state to non-elected members. The caretaker govt system should be completely removed!. Instead, the government at the end of its 5 years terms - should enter in a state called, "Interim Governance Period" of 2 months and 20 days whereas the PM and his cabinet have "limited" executive powers. The ECP will make the preparation to hold the election in this time period, and after the election, powers will be handed over newly elected PM by former PM in front of Parliament. As explained above, I think care taker government is a must thing between the two elected governments. There should be a clear legislation for caretaker government: free and fair from any political or personality influence. @Junaid - No. 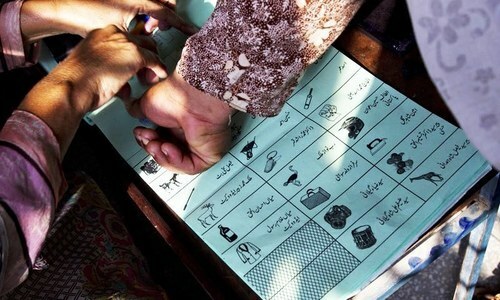 The Election Commission of Pakistan needs to be strengthened in being fully impartial in running the election process. As a country we are so very divided, no government continues the policy of its predecessor, there in nothing like continuity. China and India both have continuity, hence they are years ahead of us, there is nothing like caretakers in China or India, stop fooling around with the peoples resources. The Indian method, of taking entire administration out of Govt and putting them directly under election commissioner with "Code of Conduct". The first thing EC does is make transfers across country, so no party has an advantage and Political leader can't make any policy decisions without EC blessing. Informative article Is it safe to assume we never had caretaker before 1990 because no democratic government held an election before then? Very helpful article, thank you. The outgoing elected Prime Minister must be given a formal advisory role to the care-taker in Defence and Foreign Policy making. We do not need care taker Governments. It is a sham. Honestly, the real shadow Government is firmly in place. We need true democracy and the Shadow Government should be put in its place.